Robert Gagno is leaning over a pinball machine Sunday at Vancouver's Flipout Pinball Expo, surrounded by dozens of other players at various machines. He scores 100,000-point jackpots every few minutes. "A 100,000 score on this machine would be good," explains Gagno's mother, Kathy, a Burnaby school psychologist. "I've seen him play an hour on the first ball," she says. Robert's score hits 100 million, then 200 million. After he loses his third ball, his score sits at 320 million, a new record for the machine. Gagno, 28, who has autism, won the world pinball championship earlier this year in Philadelphia. Last weekend he also placed first in a tournament for Pacific Northwest in the U.S.
"It feels amazing when I'm playing 100 per cent and I'm in the zone," Robert says during a break during the Vancouver tournament, which he didn't win. "I'm feeling a bit tired and need a break," he says. His father, Maurizio Gagno, an electronics technologist manager, says his son has a photographic memory. To demonstrate, the dad brings up the image of a roulette wheel on his phone. Ask him to recall the numbers on the wheel, either clockwise or counter-clockwise, the dad says. Let's go clockwise, I suggest. Robert lists off the numbers all the way around the roulette wheel without a single error. His mother says that one time when Robert was playing a pinball tournament in Las Vegas, they let him play three games on the roulette wheel. He won three times, walking away with $900. "We don't know how he really does it," Kathy Gagno says, adding the Robert is naive in many ways and doesn't really understand things like money, so for now still lives with his parents. Although Robert was a cute kid -- he got a role as one of the kids in the made-in-Vancouver movie Look Who's Talking 2 with John Travolta at the age of 18 months -- his parents were concerned that Robert wasn't talking at that age. They thought he might be deaf. They would later learn he has autism. His parents first noticed their son's pinball talent when they were having dinner at the now defunct Wally's Burgers when their son was about five years old. "He was a hyper kid but he got really focused on the pinball machine." His parents bought him a pinball machine for his 10th birthday. And while Robert's dad was on a business trip to Toronto, he noticed there was a pinball tournament and took Robert to play. 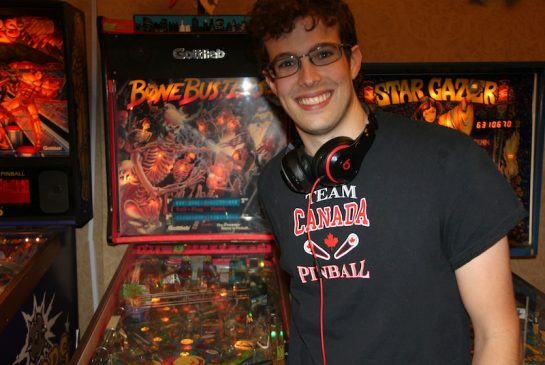 He did amazingly well and soon ranked in the top five pinball players in Canada. He now has a dozen pinball machines in his parents' garage, which is set up as an arcade. "That was the best feeling ever." He adds that the trophy he took home weighs about 35 pounds. Robert's long-term goal, however, is to live on his own one day. "And have a girlfriend," his father says. A documentary was made this year about Robert Gagno called Wizard Mode.